This 1903 map is beautiful in a calculated way, Unlike the antebellum Hopkins watercolors of the Domain, the map and photographic images in "Conservative Lumbering" eschewed Romantic aesthetic evaluations for the fact-based approach of modern forestry, the practical dollars-and-cents of managing the Domain in the best interests of the University in the present and future. Proponents of big development projects, like the dam proposed for Yosemite’s Hetch Hetchy Valley, flashed their masculine credentials as hardheaded businessmen bringing practical benefits like jobs and prosperity. They derided the valley’s protectionist defenders – like John Muir, the early twentieth century’s leading wilderness protector – as counterfeit men. 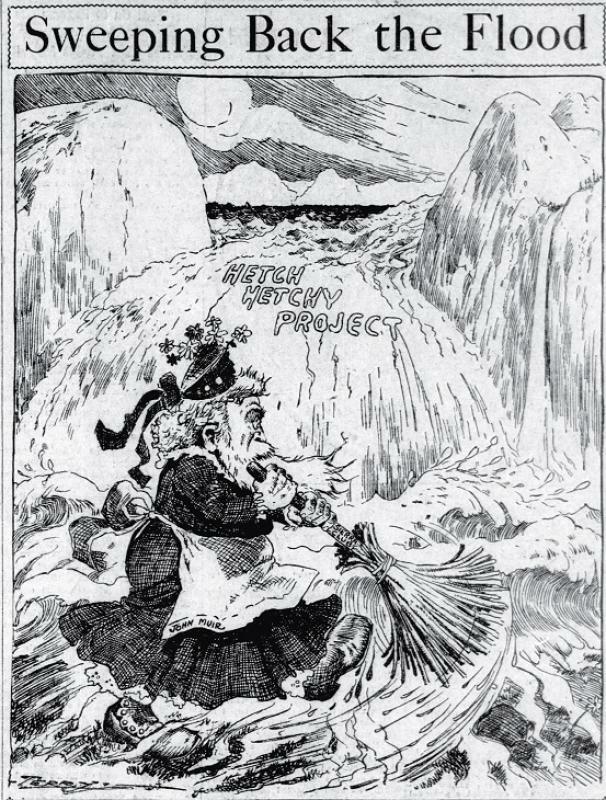 This 1909 cartoon from a San Francisco newspaper underscored the unmanly or womanish idealism of so-called “nature lovers” by putting Muir in a frock, hysterically trying to sweep back the flood of the dam project. “Sweeping Back the Flood,” San Francisco Call, Dec. 13, 1909. When B. Lawton Wiggins advanced from faculty to Vice Chancellor’s office in 1893, the Purple praised him as “the man best calculated to throw off the clogs of old customs, which have so seriously retarded the material progress of the University in the past, and to infuse new life in the place.” Wiggins’s arrival coincided with the fading of the University’s Civil War generation of leaders, which enabled him to promote a more national and less sectional institutional identity and to modernize its curriculum. Wiggins’s embrace of rough virile sports was one way he modified the customary expectations of Sewanee men. Another was his conservationist approach to the University’s Domain, particularly its forests. Wiggins brought Sewanee’s vast acreage under the scientific and – according to its proponents – vigorously masculine management of modern forestry. At the turn of the twentieth century most Americans regarded the supporters of protecting public lands from development, conserving natural resources, or beautifying industry-blighted landscapes as gender deviates: in the vocabulary of the time, “nature lovers” or “short-haired women and long-haired men.” A major reason they ridiculed such advocacy as “sissy” or “sentimental” was that women had dominated the early movements to protect wilderness regions. Even men with impeccable and manly scientific credentials had to frame their conservationist or protectionist actions or advice in consciously hypermasculine terms lest they be discredited as weak or effeminate. These gender concerns affected Wiggins’s efforts during this period to gain control over and manage the woodland resources of the 10,000-acre Domain and to commence formal academic instruction in forestry science. The Domain’s forests and lands were among the University’s most valuable resources. However, by the 1890s they had been depleted. In some cases, the University itself recklessly harvested stone for its own structures or for sale. In others, the sizeable local population on or off the mountain treated the University’s lands as a commons where they could cut trees for firewood to use or sell. Frequent fires had devastated the Domain, and freely grazing livestock roamed and ate at will. Strapped for funds in 1896, the University considered a trifling offer of $2,000 to clear-cut what trees were still standing. 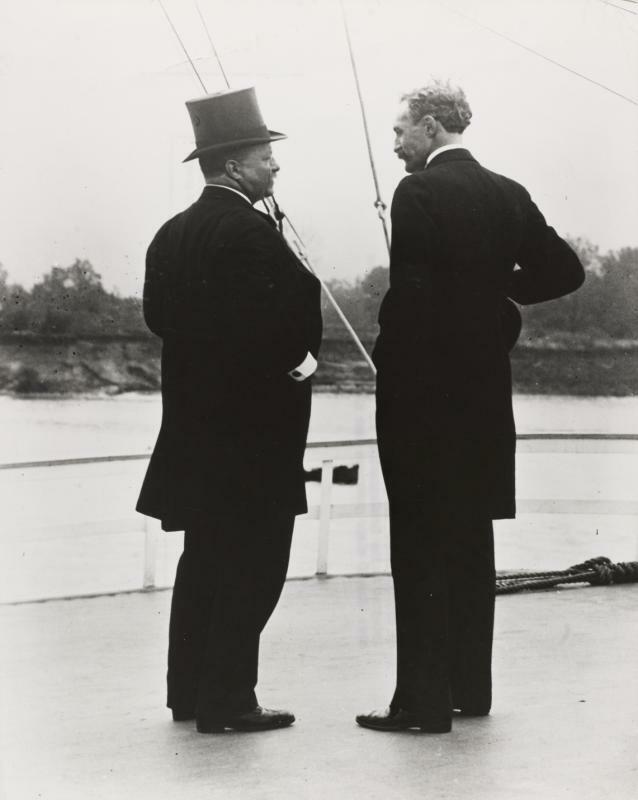 Vice Chancellor Wiggins convinced the Board of Trustees to reject that offer and to seek instead the guidance of the nation’s leading scientific forester, Gifford Pinchot. His visit to Sewanee in 1898 was a landmark event in the University’s history. It led to a formal “scientific” study of the Domain landscape and a report, “Conservative Lumbering at Sewanee, Tennessee” (1903), which outlined a practical plan for rationally protecting, harvesting, and sustaining the resources on the Plateau. It has influenced University policies ever since. Wiggins pushed hard to incorporate the discipline at Sewanee and adopted Pinchot’s characterization of forestry as a thoroughly masculine discipline that prepared young men to lead useful and practical lives. Wiggins similarly advocated a strong federal role in managing the nation’s forests. He also believed that universities needed to furnish the nation with academically trained foresters. His speech to the American Forest Congress in 1905 praised the practicality and realism of scientific forestry and declared Sewanee a convert to and “zealous missionary” of “the gospel of forestry.” Wiggins died in 1909. 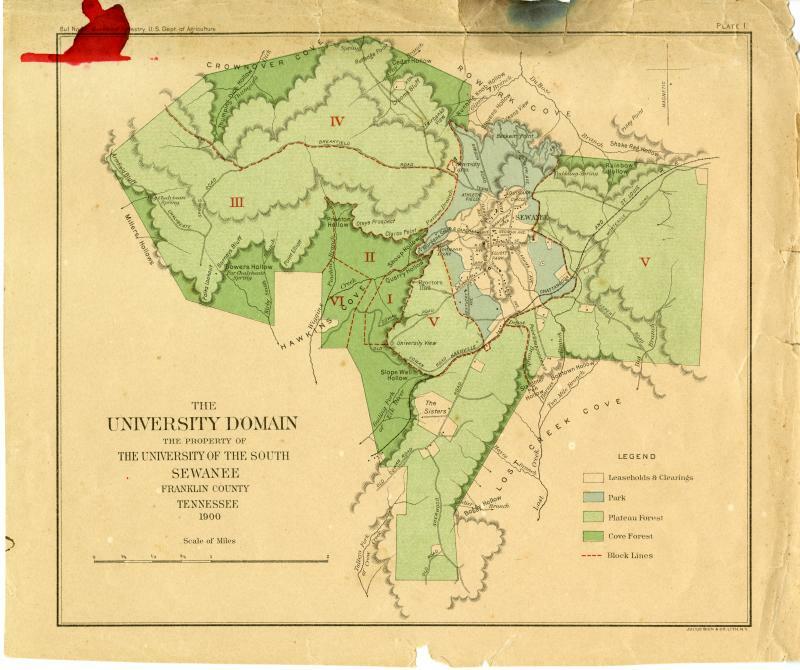 The University did not begin forestry instruction until 1923, but its use of a forestry management plan made Sewanee the first of America’s universities to do so. Here Wiggins explains the kind of man a university course in forestry would make. - B. Lawton Wiggins, “The Attitude of Educational Institutions Toward Forestry,” Proceedings of the American Forest Congress Held at Washington, D.C., January 2 to 6, 1905, under the Auspices of the American Forestry Association (Washington, D.C.: H.M. Suter Publishing Co.). On the mountain true manhood (or the lack of it) corresponded to class divisions. The report advised the University to erect a virtual fence between its own forested Domain and the local mountain people, who were accustomed to using the land and forests as they needed or saw fit, which is to say selfishly and unscientifically. The report’s characterization of the local people’s practices as evils – the lack of self-restraint and respect for private property, abuse of privileges, laziness – demeaned the manhood of the mountain men to consolidate its case for scientific forestry in the gendered terms of specialized and intelligent management. From John Foley, Conservative Lumbering at Sewanee, Tennessee (Washington: Government Printing Office, 1903).